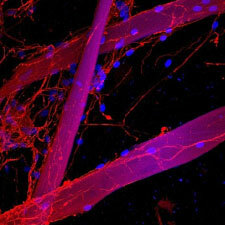 Confocal micrograph showing nerve cells growing along fibers (purple) made from a specially modified silk that is similar to that made by spiders and silkworms. Schwann cells, whose nuclei are shown in blue, attach to the fibers and support the growth of the nerve cells. This system is being looked at as a possible treatment for damaged nerves and, in the long term, spinal cord damage. This image(www.cellimagelibrary.org/images/38921) was prepared by John Priestley and is licensed under a Creative Commons Attribution, Non-Commercial, No Derivatives License.